Home theaters can transform your everyday TV and movie watching experience into an engaging, cinema-like event. With high-quality surround sound speakers, you’ll be able to hear aspects of the film’s soundtrack you may not have heard before. You can host movie nights at your home for a fraction of the cost of bringing your family and friends to see a movie in a theater. We reviewed dozens of home theaters to figure out which models were the best. We looked at a wide range of models, including home theaters with wall mounts, remote connections, and all-in-one starter kits. We also evaluated performance, cost, and customer reviews. The Energy 5.1 Take Classic Home Theater System was the clear winner of the home theater systems that you can buy online. It is an extremely popular model that more than 1,000 people have left positive feedback about. It is relatively affordable and effective for both small and large rooms. 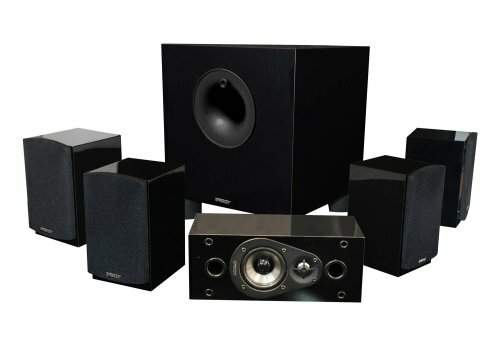 The Energy 5.1 Take Classic Home Theater System is an extremely popular and reliable home theater system from an industry leader in surround sound. It is a mountable wall system with five speakers and one 200-watt subwoofer that deliver the quality you’d expect from top home theater system. The speakers should be mounted at least six feet high for the best performance. Its speakers better produce a wide audio range from its flat on-axis frequency response. Its patented Ribbed Elliptical Surround Technology that improves its sound, reduces distortion and creates a more efficient design. You’ll need to purchase the Starter Kit option or use an existing receiver to install this. Although its much more expensive than some of the other home theater systems on this list, the Sonos 5.1 Home Theater Set with Sonos Play is an excellent investment with notable quality. It can play HiFi sound if you use it with a compatible HD television. It can be controlled with a mobile app with your smartphone or tablet, as well as a laptop. The subwoofer is known for its deep and rich sound capable of filling a room. Its design makes it easy to install anywhere, even under a couch or other furniture. Its special force-canceling speakers reduce buzzing sounds that you may experience from other brands. 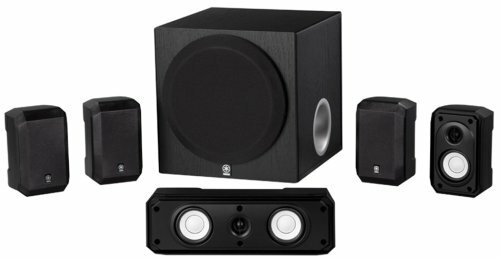 The Yamaha NS-SP1800BL 5.1-Channel Home Theater Speaker System is the best budget option that you can get for your home theater system. It combines the features that you need for a quality audio experience at a cost of $150. With this package, you’ll get four satellite speakers with compact, lightweight designs. That makes them easy to install nearly anywhere. These speakers have a wide frequency range of 28Hz to 50kHz. The subwoofer takes advantage of the Advanced Yamaha Active Servo Technology to improve sound quality. It aligns the functions of the amplifier with the speaker to reduce impedance so that the sound quality comes through clearly. At 100 watts, the subwoofer is capable of producing clear and powerful low-end sounds that fill a room even at low volumes. The Fluance SXHTB-BK High Definition Surround Sound Home Theater is the best option for surround sound systems. This collection of speakers gives you more than enough power to create high-quality sounds. The large stacks use dual 6.5-inch woofers to enhance the low-end. Combined with construction-grade MDF cabinets, these speakers have high-quality outputs across their entire range. Each set of these speakers is assembled by experts who can voice and timbre-match them for the best collective performance. With exceptional craftsmanship including gold-plated connection points, Fluance backs them with a lifetime warranty. The Yamaha YHT-3920UBL 5.1-Channel Home Theater in a Box System with Bluetooth gives you the best wireless audio experience in your home theater. Switching to a wireless system makes it easier to position your speakers for the best performance without the need for long wires. The system is easy to setup and provides high-quality audio even without the use of high-quality cables. This system also comes with an integrated Bluetooth receiver making it possible to stream music through other smart devices. The quality of the signal is improved using Yamaha’s compressed music enhancer software, which fixes signal quality degradation and restores the quality of the audio experience. Combined with Yamaha’s Virtual Cinema system, you can get theater quality audio at home. Home theater systems are great for a variety of people, from TV and movie enthusiasts to luxury home owners that want to create a theater room. These systems bring the audio track of what you’re watching to several speakers placed around the room to allow you to hear the film the way it was intended. You don’t need a separate theater room to enjoy a home theater system. It can be placed in any living room or family room. They’re also ideal for large families. Instead of spending a few hundred dollars taking your family to an overpriced movie theater to sit in popcorn-covered seats and walk across a sticky floor, that same money could be spent on a home theater system. Then you could rent a movie, pay for Pay Per View, or purchase a movie to watch using your home theater system’s speakers. Sensitivity. The sensitivity of a home theater system indicates the decibels and general sound quality of the speakers. Frequency response. This range signifies what sound frequencies the speakers pick up. A larger range means you’ll be able to hear more nuanced sounds. Channels. Many of the best home theater systems offer 5.1 digital surround sound, which is how movie studios record and set it up for theaters, such as Dolby Digital Sound. Grill cloth. A grill cloth can protect your speakers from dust and dirt without impacting the sound. THX certification. THX Certification is a quality assurance program for home theaters that demonstrates a product is capable of reproducing movie theater quality sound. Installation. Home theater systems vary in the amount of installation they require. The models with the easiest installation requirements are Bluetooth or wireless models, while others may require permanent installation. Subwoofer. Subwoofers reproduce low bass frequencies, which are important in creating a full sound to movie audio tracks and in music. Inputs. Some home theater systems have a single input to connect your TV, DVD player, or game system, where others have multiple inputs. Try to find a home theater system that has as many inputs as devices you regularly use. Bluetooth or wireless connectivity. Instead of relying on wires that you’ll need to set up around your living room, Bluetooth and other wireless home theater systems can be installed without the wires. How do surround sound systems work? Most studio-produced movies and TV shows are filmed using multiple channels (a.k.a. audiotracks) to record the audio. When you play a movie on your TV, it is a two channel sound system that comes from your TV’s speakers. With a surround sound system, you can hear more of the channels on speakers placed around the room. If noise comes from one direction on the screen, it will come from the speaker on the same side of the room. This makes it a more immersive experience, as you’d find in a movie theater. What is included in a home theater system? While each home theater system will vary depending upon the model and number of channels, the most common and basic home theater system is a 5.1 channel system. It includes a receiver, five speakers, and a subwoofer. With five channels, one speaker is placed in the center, two in the front, and two in the back of the room. What does a receiver do for a home theater? The receiver is what converts the signals from your input devices, such as a DVD player or video game console, for your output devices, such as the surround sound system. Some receivers have built-in media players, while others rely on your existing media players. How much does it cost to build a home theater? The cost of creating a home theater ranges from $500 to $10,000, depending on how you choose to do it. If you only buy a home theater system and use your existing furniture, media players, and rooms, it will be less expensive than creating a separate space with a new TV setup, furniture, and acoustic panels. We looked at 20 other home theater systems. Even though they didn’t make our 5 best home theater systems list, they’re the best of the rest and each is still a great option for your home. The information you’ll need to compare each one is included with the listing. For a high-quality sound experience, start your search with the Definitive Technology ProCinema 600 5.1 Home Theater Speaker System. It has a wide frequency range with reinforced low-end speakers. The high-end comes through clear with an aluminum dome tweeter for stronger frequencies. This unit easily blends in with your home decor in a gloss black or white finish. You can also try the Definitive Technology ProCinema 800 5.1 Home Theater System which is available in a gloss white finish. It includes six speakers with four satellite speakers and a compact subwoofer. The subwoofer is designed to deliver high-quality and power while being compact enough to mount in most places. It has eight-inch cones and is powered with 300 watts for higher-quality audio across its range. For a strong audio quality experience, try the Harman Kardon HKTS 30BQ 5.1 Home Theater Speaker System. You’ll get a six-speaker system that includes an eight-inch subwoofer and four identical satellite speakers. To make it easier to install, this set comes with all of the mounting hardware and cables that you need. The audio quality is much better with the midrange drivers in the satellite speakers and the main speaker. That way, you get the best sound from a full range in each speaker rather than the satellites having range limitations. The Harman Kardon HKTS20BQ 5.1 Home Theater Speaker System can give you a lightweight and more affordable high-quality audio system. The speakers are video-shielded to reduce interference from TVs, monitors, and other display systems. The set includes four identical and lightweight satellite speakers, as well as an eight-inch 200-watt subwoofer. The center speaker has voice-matched and shielded drivers for added power and quality. The Sonos 5.1 Home Theater Set can improve your home theater experience with a set of four wireless speakers. The satellite speakers and the Playbase (center channel) have low-profile designs so that they disappear seamlessly into your home theater space. The Playbase can even be used as a TV stand for lightweight flatscreen TVs up to 75 pounds. It contains ten drivers that work together to produce a higher quality of sound across a more dynamic range. The Sonos Sub uses a face-to-face configuration for the speakers that maintain a high-quality low-end, but cancel out each other’s vibrations. That way, the Sub won’t shake or rattle even at full power. This Yamaha YHT-399UBL 5.1 Channel Home Theater in a Box System makes it easy to enjoy your music without a complicated channel system. The main system box has a USB connector so that you can directly connect iPhones and other smart devices to listen to your music. The set includes six speakers with an eight-inch subwoofer and four small satellite speakers. Their compact size makes it easy to mount your satellite speakers to walls or on top of other stands where they are needed. The system also comes with a remote for easy access and control. For a more advanced home theater system, go with the Klipsch RF-7 II Reference Series 7.1 Home Theater System. It includes eight large speaker cabinets that let you get the best sound quality through increased power and air movement. This set has a unique look with its copper-plated speakers. Because of their size, each speaker cabinet can produce higher-quality sound that stays clear even at higher volume levels. Despite their power, the sound that these speakers produce is non-fatiguing so that you can listen for extended periods without hearing damage or fatigue. This Onkyo SKS-HT993THX 7.1 Ch. THX Home Theater Speaker System offers high-quality audio at a more manageable price. The speakers use acoustic suspension design techniques to improve the sound quality and to reduce the vibration within the cabinet. The system has 7.1 channels including a 125-watt subwoofer for added low-end. For an added level of quality, check out the Onkyo THX Certified 7.1-Channel Surround Sound Speaker System Black (HT-S9800THX). It is THX certified for the highest in audio quality. It is also compatible with Chromecast and other connectivity systems like Bluetooth and Spotify. That way, you can directly access your music without other smart components. The Bose Acoustimass 10 Series V Home Theater Speaker System installs with a cleaner look since they mount flush to the wall. The addition of Acoustimass technologies gives the subwoofer added low-end power. This set also has all of the cables and connectors that you need, and they are labeled so that installation is very easy. If you want a more affordable option with strong performance, try the Harman Kardon HKTS 16BQ 5.1 Channel Home Theater Speaker Package. It is a 5.1 system that can be expanded to a 7.1 channel system with the addition of two speakers. All of the speakers in this package are voice-matched for more symmetrical performance. It also includes a 200-watt, down-firing subwoofer for added low-end with advanced phase and booster controls. If you like powerful sound but like to listen for hours, then you’ll want to check out the Klipsch Reference 5.1 Channel R-24F Surround Home Theater Speaker Bundle with 12″ Subwoofer. It uses copper woofers and suspension systems to produce high-quality audio that is also non-fatiguing. That way, you can listen for extended sessions without experiencing hearing fatigue or loss. These speakers are also designed to be energy-efficient, which is better for your home in the long run. The Orb Audio Mini 5.1 Home Theater Speaker System has a unique ball speaker design that can change how your home theater looks and sounds. It has five identical ball speakers and a subwoofer. The ball speakers can be mounted using omnidirectional mounts so that you can point them exactly where you need them to go. This Polk Audio RM705 5.1 Home Theater System uses super compact speakers with a triangular design for maximum performance. The speakers all have non-resonant composite enclosures that stop vibrations. They are also magnetically shielded to limit signal interference from TVs and other media sources. 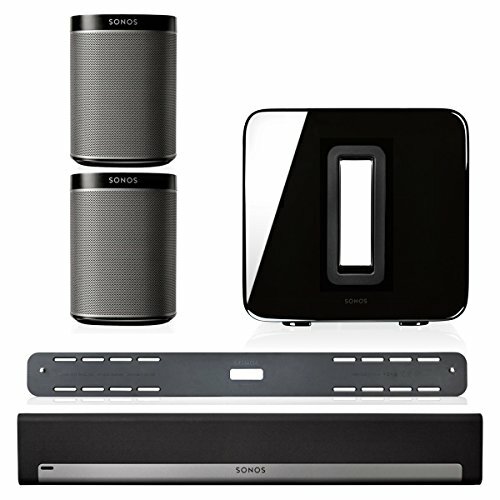 The Sonos 5.1 Surround Set – Home Theater System gives you a wireless sound system with exceptional audio quality. The subwoofer uses a face-to-face speaker design which creates more resonant low-end sounds but cancels out the vibrations in the cabinet. The sound bar can be wall mounted to take up less space and to fit in better with your home system. The satellite speakers are lightweight and compact, which makes them easy to mount where you need them. This Bose SoundTouch 300 Soundbar with Wireless Surround Speakers and Bass Module package includes a soundbar, two satellite speakers, and a white base module. The design is made to be stylish without compromising sound quality. It connects with HDMI compatible devices for easy integration into your home theater system. The speakers are also wireless to minimize the amount of space needed for the system. Bose reduced the size of the speakers to make them smaller than any other model. That way, they fit exactly where you need them. The Enclave Audio CineHome HD 5.1 Wireless Audio Home Theater System doesn’t require the purchase of additional components to use. The centerpiece, the Enclave Smart Center, serves as the central hub for the entire system. All of your audio visual equipment can be routed through it using the three HDMI ports or other connectivity features. If you want to control it with a smart device, you can use the Enclave Audio app to connect with it. The Pioneer 5.1 Home Theater System HTP-074 gives you compact 150-watt speakers with a high-quality finish alongside a 100-watt subwoofer. It uses some of the highest-tier technologies including Dolby True HD, Dolby Digital Plus, and Dolby Pro Logic II. This system is 3D compatible with a variety of media types and offers HDR support. Smart devices can connect to the system as well since it has an integrated Bluetooth receiver. For a more affordable and simplified option, try the Samsung 2.1 Channel 300 Watt Sound Bar with Wireless Active Subwoofer Home Theater System. It comes with an extended sound bar and a subwoofer. The entire system is wireless for easy positioning and connectivity. The wireless feature is also compatible with several Samsung TV models, eliminating the need for a wired connection. Other TV models can connect through the HDMI port. Bluetooth-enabled smart devices can take advantage of the integrated Bluetooth for streaming music. 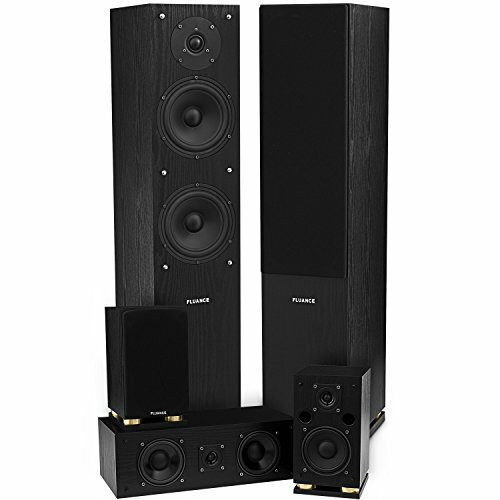 The Yamaha YHT-4920UBL 5.1-Channel Home Theater in a Box System with Bluetooth integrates into home theater systems easily with a range of connection types. It includes a 4K Ultra HD pass-through to connect with high-quality output devices without losing signal quality. The package also comes with a 6.5-inch 100-watt subwoofer that creates an enhanced low-end sound with the integrated bass boost. You can connect smart devices to stream music using the integrated Bluetooth as well.